Before 1979 motorcycle design was simple. You put a wheel at each end and an engine between the two. There was a light at the front, another at the back, a seat, handlebars, some suspension, brakes and a petrol tank. All the above components looked essentially the same as they had since the 1940s – the only room for innovation was choosing the number of exhaust pipes your bike was to have. And then Suzuki launched the Katana and everything changed. It’s impossible to overstate the impact this bike had at the time, even if it was more about the conversations than the sales figures (which, with hindsight were disappointing for such an innovative machine). The first Japanese bike with an aerodynamic, frame-mounted fairing, first with proper racing clip-on bars and the first one to break the traditional look of a motorcycle. Journalists at the time were convinced it was too futuristic for the public to understand it, but Suzuki countered that by also playing the oldest trick in motorcycling’s book – making it the most powerful and fastest bike you could buy. The inspiration came from a company called Target Design, run by Hans Muth, previously of BMW. Target had been hired by Suzuki to give them a distinct identity and the Katana was the first result of the collaboration. The thinking was to make the rider more of a part of the bike and to try and make as many components as small and tucked-in as possible for improved aerodynamics. The first Katana, launched in late 1980, designated the GSX1100S was based heavily on the existing GSX1100ET launched only a few months earlier. Where the ET model was conventionally styled and continued the trend of bikes getting bigger, heavier and faster, the Katana looked like something from Tron. The engine was the same basic 1074cc, 16v, four-cylinder powerhouse from the ET with a few tweaks to cam timing and carb settings that brought an (improbable) extra 11bhp. That figure was a long way ahead of the Yamaha and Kawasaki opposition and even Honda’s six-cylinder CBX1000 was less powerful and much more expensive. The Katana’s frame was also essentially the same as the GSX1100ET but the new model had a slightly lazier steering head angle for increased stability at speed and a completely different riding position thanks to the low-set clip-on handlebars and rearset footrests. It also had new suspension with a hydraulic anti-dive system (an early version of compression damping control) on the front forks and rear shocks with built-in levers to adjust the preload. The quirkiness continued with a beautiful set of compact clocks – possibly the best-looking instruments ever on a modern motorcycle, a choke control the size of a beer mat, suede pillion seat and a couple of unexplained, dummy switches on the lhs side panel. With a reasonably competitive price tag just under £3000 in a booming motorcycle market, the Katana should have been a sensation. But it wasn’t. Partly because most of that boom was in smaller bikes, bought by commuters in the midst of the worst recession for a generation. Partly because the riding position was so unlike anything else this side of a Laverda or Guzzi Le Mans, but mostly because British motorcyclists have always been a conservative bunch and the Katana was just too radical for most of the older riders who could afford it. On the road it felt long, stable and stunningly fast. But it was also cripplingly uncomfortable with a long stretch over the fuel tank to the low-set bars and feet scrunched up because the high footpegs and low seat made an odd combination. Like many forward-thinking machines the sales were slow, but over the years a cult following emerged and the early, radical Katanas have become very sought after. They have also become a popular donor bike for custom builders too with almost as many now sporting modern suspension, fatter wheels and engines from a GSX-R1100 or Bandit 1200. If you remember Andy Sparrow’s brilliant Bloodrunners cartoon from BIKE magazine in the mid-1980s, then chances are there’s a fat-tyred Katana special in your biking fantasies somewhere. Like all classics the golden rule when buying is take your time, stick to your budget and remember that there’s always another one that’ll be up for sale next month. The basics of a Suzuki Katana are strong, but most of them are 35 years old now. 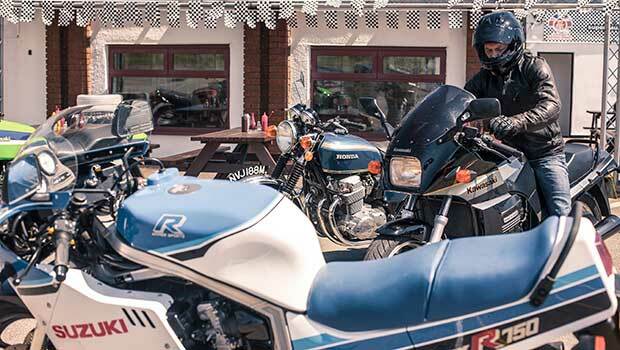 Despite only being on sale in the UK and Europe for less than five years, Suzuki kept producing the 1100 Katana in Japan till the mid-1990s and you occasionally see these bikes for sale in the specialist importers. Most have been through at least one restoration and so the hard-to-find parts have often already been found, which means a tidy Katana can be a very good buy. With a new model coming for 2019 interest will be high, meaning this could be the right moment to buy one.